The sad news comes from America of the death of the baritone John Noble after a long illness. He was born in 1931 and studied mathematics at Cambridge University. While still a student at Cambridge in 1954 he sung the part of Pilgrim in Ralph Vaughan William's The Pilgrim's Progress and went on to a professional career which included singing the role in the EMI recording under Sir Adrian Boult in 1970/71. 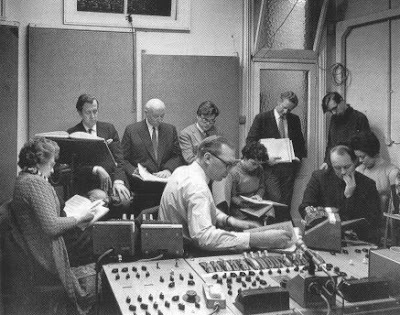 The header photo above was taken in the Kingsway Hall control room during the recording and John Noble is in the centre foreground with, from left to right, Ursula Vaughan Williams, Christopher Bishop (producer), Sir Adrian Boult, Ian Partridge, Gloria Jennings, Christopher Parker (balance engineer), in front John Alldis (chorus master) and Sheila Armstrong. John Noble's other recordings included Britten's Albert Herring for Decca, Verdi's Macbeth and Don Carlos for HMV, and Finzi's In Terra Pax for Lyrita. He also frequently sung the role of the Christus in the Matthew Passion and movingly passed away on Good Friday. His funeral is on April 8, which quite appropriately is Sir Adrian Boult's birthday. Lead me, Lord, make my ways straight before my face. And let all men that put their trust in Thee rejoice. I've only just caught up with this sad news. John was three years above me at school (Godalming Grammar) and even then had the magnificent voice that has so resonated through the years. He first sang his well known Pilgrim's Progress at Charterhouse while I was still at Godalming Grammar and his performance stands out in my memory even after all these years! He was a true hero to all of us who revered his musical performances which we were fortunate enough to share during our school days!